Relationships - The "Happiness Loop"
Relationships can help you be happier and more fulfilled. Even more importantly, happiness (and being as happy as you can possibly be) will create and maintain better, long-lasting relationships for you. It's an amazing phenomenon. I call this the "Relationship Happiness Loop"
And, most importantly, relationships are part of what I call the essential "3-R's" of happiness (see my BeHappy! intro video and a fundamental 3-R's introduction to the subject by clicking here). 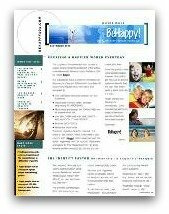 This relationships section of the BeHappy! site is all about how to start, build, maintain, and nurture the best possible relationships (of all kinds) - the first of the essential 3-R's. It may even help you find your soul mate, improve your marriage, have a better relationship with your children or your parents, and many other things. "In relationships, the little things are the big things"